Al Runyan was born on August 11, 1928, in Los Angeles, California. He enlisted in the Aviation Cadet Program of the U.S. Air Force on August 16, 1949, and was commissioned a 2d Lt and awarded his pilot wings at Williams AFB, Arizona, on February 10, 1951. Lt Runyan next completed F-80 Shooting Star Combat Crew Training before serving as an F-80 pilot with the 25th Fighter Interceptor Squadron in Korea from June to November 1951, and then as an RF-80 pilot with the 15th Tactical Reconnaissance Squadron in Korea from November 1951 to April 1952. His next assignment was as an RF-80 pilot with the 155th Tactical Reconnaissance Squadron at Shaw AFB, South Carolina, from May to December 1952, followed by service as an RF-80 pilot with the 302nd Tactical Reconnaissance Squadron at Shaw from January to March 1953. 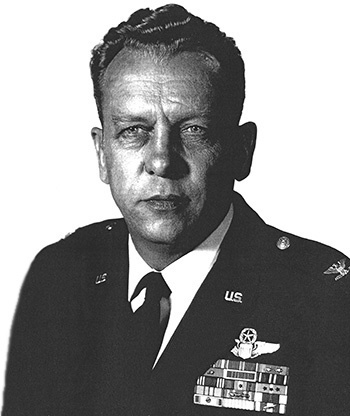 Capt Runyan served as an RF-80 and then as an RF-84F Thunderflash pilot with the 18th Tactical Reconnaissance Squadron at Shaw AFB from March 1953 to January 1956, and then as an RF-84F and RF-101 Voodoo pilot and as an Air Operations Officer with the 38th Tactical Reconnaissance Squadron at Spangdahlem AB, West Germany, and then at Phalsbourg-Bourscheid AB, France, from January 1956 to January 1959. His next assignment was as an RF-101 Voodoo pilot with the 20th Tactical Reconnaissance Squadron at Shaw AFB from February 1959 to April 1960, followed by service as an Air Operations Officer with the 837th Air Division at Shaw from April 1960 to January 1961. He then served as an RF-101 pilot with the 32nd Tactical Reconnaissance Squadron at Toul Rosieres AB, France, from January to February 1961, and then on the staff of the 66th Tactical Reconnaissance Wing at Toul Rosieres and then Laon AB, France, from February 1961 to August 1964. Maj Runyan next received an Operation Bootstrap assignment to complete his bachelor's degree at the University of Omaha, Nebraska, from September 1964 to March 1965, followed by service on the staff of the 363rd Tactical Reconnaissance Wing at Shaw AFB from March 1965 to January 1966. He then served as an RF-101 pilot with the 20th Tactical Reconnaissance Squadron at Tan Son Nhut AB, South Vietnam, from January 1966 until he was forced to eject over North Vietnam and was taken as a Prisoner of War on April 29, 1966. After spending 2,482 days in captivity, Col Runyan was released during Operation Homecoming on February 12, 1973. He was briefly hospitalized to recover from his injuries at Sheppard AFB, Texas, and then served as Deputy Base Commander at Kirtland AFB, New Mexico, from August 1973 until his retirement from the Air Force on May 19, 1974. Al Runyan died on March 30, 2012, and was buried at the Gate of Heaven Cemetery in Albuquerque, New Mexico. For the period June 1969 to September 1969: This officer distinguished himself by gallantry and intrepidity in action in connection with military operations against an opposing armed force during the above period while a Prisoner of War in North Vietnam. Ignoring international agreements on treatment of prisoners of war, the enemy resorted to mental and physical cruelties to obtain information, confessions, and propaganda materials. This individual resisted their demands by calling upon his deepest inner strengths in a manner which reflected his devotion to duty and great credit upon himself and the United States Air Force.